Just a quick check on my current projects. Vivian is coming along quite nicely!! Actually I’m loving this sweater and can’t wait to wear it. 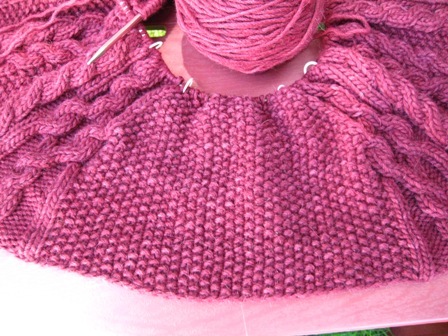 Just look at it…I can’t knit fast enough. And here’s a little BSJ for Kira. It’s the time of year when you need a little something extra in the mornings or evenings. This BSJ is a bit special though as I’m experimenting with something, let’s see if it works. I’ll fill you in later. 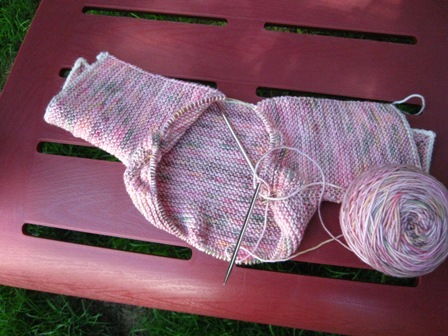 The yarn is Colinette Jitterbug, in Peaches and Cream. The temperature has dropped around here, overnight it seems and I’m loving it. 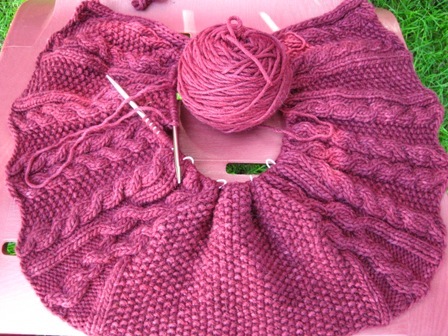 September is my favorite month, it’s my birthday month and I have great projects on needles…life is good. Sweaters for both of you! I especially love the deep pink and cables of yours. It’s my birthday month, too! Virgo or Libra? Vivian is gorgeous! Love the cables and color. The BSJ is cute too! on September 3, 2009 at 3:31 am | Reply Kim D.
You and Kira are going to be styling!! !